Many businesses are by now familiar with reporting their scope 1 and scope 2 GHG emissions from sources they own/control and from purchased energy respectively. Scope 3 emissions are generally much larger and far more significant. We now have the analysis technology, data and industry standards to provide a comprehensive value chain analysis including a full accounting of scope 3 emissions. The GHG Protocol states: Scope 3 emissions are often the largest source of emissions for companies and therefore often represent the largest opportunity for greenhouse gas reductions. Scope 3 emissions include upstream activities such as the production of goods and services purchased by the company, as well as downstream activities such as consumer use and disposal of products sold by the company. 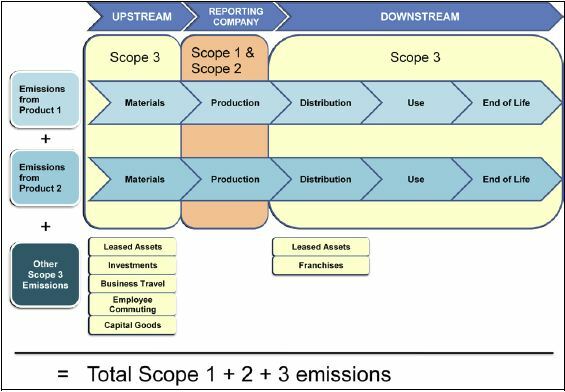 A comprehensive approach to corporate GHG emissions measurement, management and reporting – incorporating scope 1, scope 2 and scope 3 emissions – enables companies to focus on the greatest opportunities to reduce emissions within the full value chain, leading to more sustainable decisions about the products companies produce, buy and sell. A scope 3 emissions inventory can reveal significant opportunities for improving resource efficiency – for more insights on this, see our recent article on how scope 3 inventories can be part of an overdue solution for advancing the efficiency of material use. Manufacturing, processing or cooking at your facilities - including all energy use, water use and waste disposal. Delivery of products through distribution and retail stages to consumers or other businesses. Use and disposal of products and packaging by end users. We will not only provide a detailed accounting of your scope 3 emissions (along with scope 1 and scope 2 emissions) and assist with proper reporting of these emissions, but also help you discover hotspots and inefficiencies in your operation which represent opportunities for both emissions reduction and cost savings. Â© Copyright 2007-2011 by CleanMetrics Corp. All rights reserved.